Ademo Freeman is sitting in a cage at Valley Street Jail in Manchester, NH. His “crime”? Highlighting the double-standards claimed by some who wear “Manchester Police Department” badges on their costumes*. 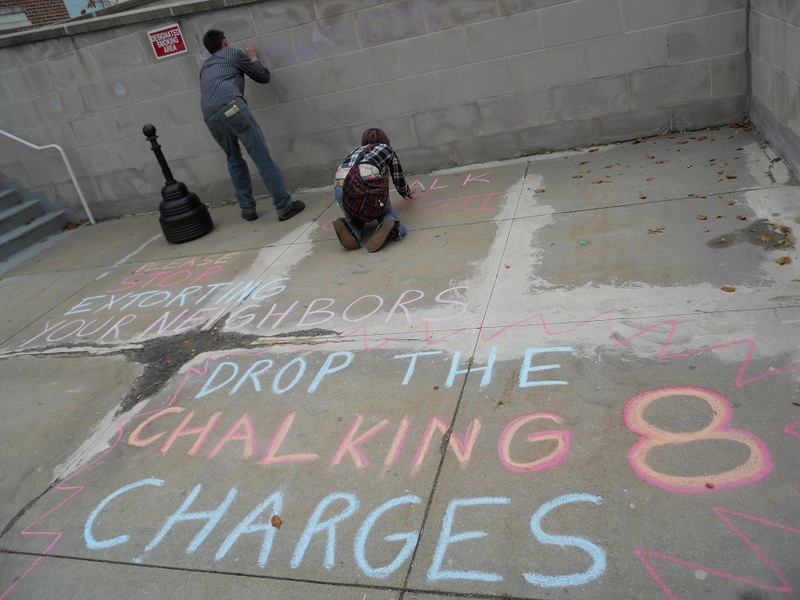 After a six-month ordeal, Ademo was found guilty of two “class a misdemeanors” for resisting (going limp) and one “class b misdemeanor” (for using children’s chalk on a public building). For such egregious actions Ademo was “sentenced” Monday morning at Manchester district court. In true government efficiency, the kangaroo his proceeding began 30-minutes late. “Prosecutor” Gregory Muller started by reciting Ademo’s past run-ins with individuals who claim the “legitimate” right to use force in an arbitrary political boundary.Included in that list-of-actions-that-had-no-victims was Ademo’s 2007 felony (for having a plant some strangers deemed “illicit”). Muller proclaimed that the previously levied sentences had had no deterrent or punitive impact. As such, for his two “class a offenses,” Muller advocated for Ademo be caged for 12-months, with 10-months stayed (concurrent sentence). For his “class b offense” Muller claimed “the state” was owed 375-FRNs. William H. Lyons (who wore a black robe) asked Ademo to comment on what he had heard. Per the monetary claim, he stated that he’d be willing to do community service and even pay “a reasonable amount.” Per the cage time threatened Ademo pointed-out the big discrepancy that existed between the action and penalty, and that the 2 1/2 days he’d already spent in a cage (arrested on Sat. June 4th and arraigned on Mon. June 6th) were more than adequate. Lyons t0ld Ademo that he had “an incorrect memory” as Ademo had stated the total clean-up cost for his chalking (a firehose used to spray-off the chalk) was125-FRNs when in fact the cost was 375-FRNs due to the fire department’s three-hour minimum**. Lyons told Ademo that because he used non-toxic children’s chalk on public property he owed “the state” 200-FRNs plus a 48-FRN “penalty assessment.” And, because he went limp when he was unjustly arrested he is to spend 12-months in a cage, with 10-months stayed (as a concurrent sentence), so long as he had “good behavior” for two years (which includes not violating a Manchester “city ordinance” against graffiti). Ademo communicated that he didn’t intent to fund “the state.” In lieu of paying the 248-FRN ransom he indicated his preference to sit the time. He was taken directly from sentencing to Valley St where he’ll be through the week. Re: the threat to be caged for 12-months (with all but two months stayed), Ademo noted his plan to appeal. Ademo had arrived at Manchester district court with friends who love and support him. He left in handcuffs led by strangers to a cage. For what?! Ademo is guilty only of drawing attention to the blatant rights-violations committed by some wearing “Manchester PD” badges, which has only been compounded by those involved who have not spoken up for what is right. In five days Ademo will be free(r) then he can dig into his appeal. get involved with Cop Block – as a contributor, by submitting a story, or anything else. This is a decentralized project – you don’t need our permission to use the Cop Block label to advance the simple but powerful idea that badges don’t grant extra rights!